I really hope this isn't a surprise to anyone who lives in the United States. 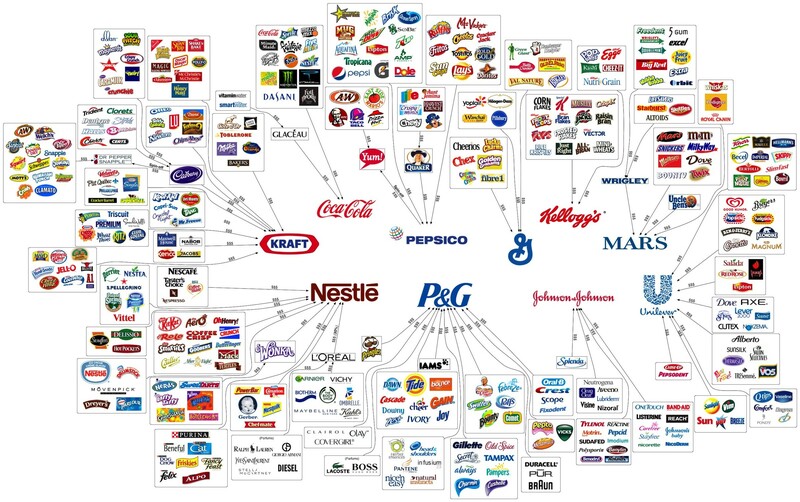 It's a graphic made by The Huffington Post that illustrates the 10 companies that own almost all the brands you buy in the grocery store. I'll leave it to you to decide if this is good or bad. I just would like more people to realize it. What I thought was weird was how little of this stuff I buy anymore. In my quest for biodegradable cleaners, unbleached/recycled paper products, whole grain bread and food made from plants, I've narrowed it down to nine brands. Already I feel like I'm bragging or something, but I was kinda surprised myself that I'm as weened of the corporate teet as I am. Knowing how to cook helps. I can buy flour and sugar and make most of my own snacks. Being a rabbit helps. I just keep veggies around for when I start eating because I'm bored. Living in Seattle helps. You couldn't keep a grocery open in this town without selling hippy earth-nerd cleaners. The two biggest ones are chocolate and soda. I switched the Theo's when I learned that all corporate chocolate still comes from child slave labor   . The grand pubah of fair trade chocolate is easily Theo's here in Seattle, but it's not the only option. I'm quite fond of Equal Exchange who makes great coffee, too. For those daring enough to try more traditional and less confectioners chocolate, Taza has some adventurous offerings and an admirable Direct Trade policy. Not everyone is down for coarse ground cocoa, though, but for everyone else there's Endangered Species chocolate, which is pretty easy to find and of all the options tastes the most like candy. If the price is a deterrent, I'll tell you something I've noticed. When my office buys Hershey's Kisses, people gobble them up like they're laced with opium, but when I bring in the fancy chocolate, the same people are satiated with just a taste. Something about the quality stuff makes you savor it more while eating less, making it last much longer than the Hershey bar that gets inhaled in a sitting. Please give it a try. Believe me it's worth it..
As for soda, the truth is High Fructose Corn Syrup is not any worse for you than any other refined sugar, but refined sugar really isn't good for you. I still do like an occasional soda, as it is a beverage and I am the lord of all beverages, I just prefer it to be something worth tasting as opposed to mass produced swill. Boylan and Q make some quality pop, and I will always have a place in my heart for Red Bull, the little European company that could. Again as a Seattlite, I really should be more into Jones and Dry. I'll have to get back to you on that. Anyway, my point is you actually can live without the big ten. It's not that hard.